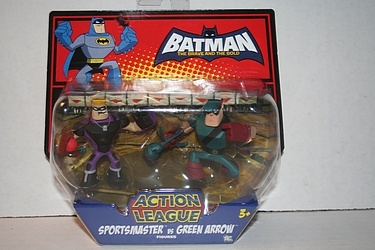 Ok, we haven't posted any figure pics in a while, so let's revisit the Batman: The Brave and the Bold line with one of the great Action League two-packs. Here we have Sportsmaster vs. Green Arrow from the Action League collection - I'm such a huge fan of this scale! I especially enjoy that these figures come with a custom backdrop, and here we have an excellent bowling alley for combat to go down. Click the image below for more pics of this great set!